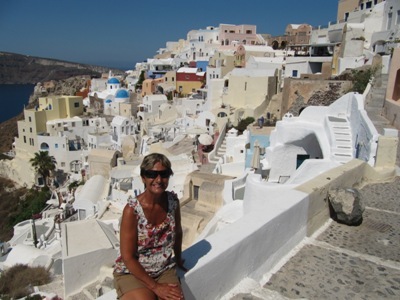 We took a one day tour that started from the island of Paros at Nousa, we got picked up by bus to Livadi from there we boarded the high speed catamaran and two hours later we are disembarking in Santorini. 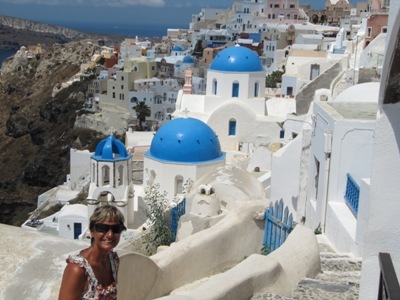 Then we went on a guided tour bus to Io, two hours free time and then another guided bus tour to Fira the capital of Santorini, we had two and half hours of free time in Fira and then at 15:00 hrs the bus took us to the ferry dock. 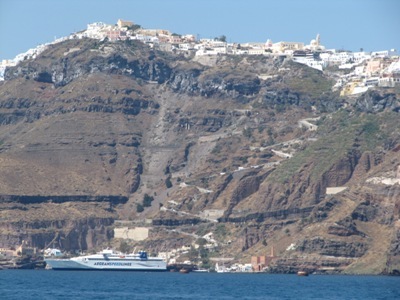 At 15:30 the ferry left Santorini and back to our boat in Naousa Paros. We had a great time in Santorini, it was busy with tourists but not to the extent of July and August, It is not a very good place to bring your boat here as the anchorages are very deep and there is only a couple of places to anchor, there is a marina on the south coast but it is very small and the entrance silts to about 1.5 meters depth. 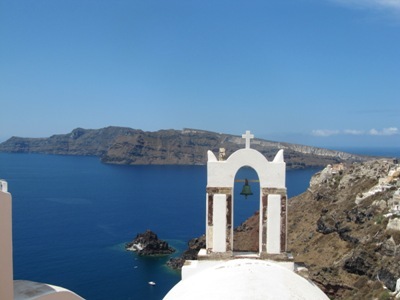 We have a page just for Santorini as we believe this is a special island with a unique history going back to 3000 years BC. 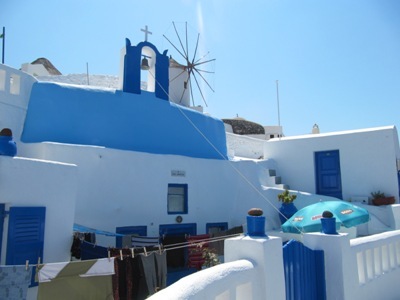 It is a very photogenic island especially the village of Io on the northern tip of the caldera, with its white houses, narrow streets, the blue painted domes of the small chapels and the windmills; make this area an amazing place to feast your eyes. The island was abandoned after the 1956 earthquake that destroyed most of the buildings but it has since been rebuilt and the tourist and wine industry is still not at its peak.